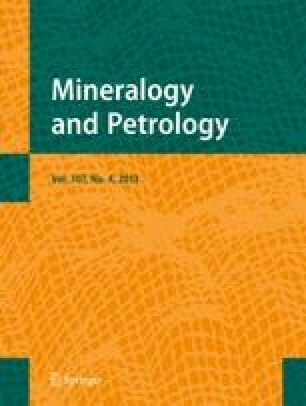 ¶Detailed petrographic, electron microprobe and ion probe studies of Archaean hydromagmatic amphiboles from the Abitibi greenstone belt, Canada, yield new insights into the origin of Al-undepleted komatiitic and Al-depleted tholeiitic and ferropicritic melts. The amphiboles are present in peridotite layers and basal chill zones of thick differentiated basic and ultrabasic sills and flows, and are titanian pargasite–hastingsite in composition. They can be grouped into two petrographic types: (1) amphibole in the groundmass; and (2) amphibole-bearing melt inclusions. The groundmass amphiboles are oikocrysts, rims and interstitial grains, present in minor to major amounts. The oikocrysts host cumulus olivines (Fo83–84) that are rounded in shape, embayed, and smaller in size. The amphibole-bearing melt inclusions are hosted in cumulus olivines (Fo83–84 in komatiitic rocks and Fo79 in tholeiitic rocks), spherical to ovoid in shape, 50–500 µm in size, and dominated modally by amphibole. The melt inclusions also contain euhedral chromite and aluminous spinel and micrometric clinopyroxene and glass, and sub-micrometric iron–nickel sulphide, chloro-apatite and ilmenite. In-situ ion probe analyses indicate the amphibole is: (1) enriched in Nb, LREE and Zr and depleted in Sr and HREE relative to primitive mantle; (2) contains up to 1–3 wt% H2O; and (3) overall displays δD values from 50‰ to −140‰, including many values in the accepted magmatic range of −60‰ to −90‰. The petrographic relationships and geochemical compositions, and comparisons to experimental systems, indicate amphibole formation by subsolidus reaction of residual hydrous silicate melt with olivine and clinopyroxene. Some of the hydrous melt intruded and was entrapped as secondary melt inclusions within relict olivine. Rapid crystallization of the hydrous melt inclusions formed amphibole+clinopyroxene±glass±spinel or solely glass. Bulk compositions of the melt inclusions, comparisons to experimental phase equilibria, and presence of magmatic water suggest amphibole crystallisation from olivine → pyroxene residual melts with at least 2–3 wt% H2O during rapid solidification of the host units. Adjustment for anhydrous phase crystallization (mainly olivine) suggests the initial melts contained 1–2 wt% H2O. Such high H2O contents and the magmatic δD compositions are consistent with the participation of H2O in melt petrogenesis. However, most Abitibi komatiites and tholeiites lack hydromagmatic minerals, making it difficult to attribute all basic and ultrabasic melts to melting in hydrous Archaean mantle. The favoured model is that some Abitibi basic and ultrabasic melts were wet and some were dry, as well as Al-depleted or Al-undepleted.